There’s so many tattered sleeves of other (greater) crime films sifting in and out of John Hillcoat’s Triple 9 that the final product plays a bit like a voodoo pincushion of greatest hits moments. There’s buttons of Heat, The Departed, American Gangster and many other crime classics, with characters seemingly beamed in from Bad Lieutenant, Sicario and End of Watch, all come to rumble in Hillcoat’s dirty little Atlanta playground. That this stable of influences is mostly able to coalesce into a largely exciting, ceaselessly dark and somewhat intelligible thriller is admirable, even if it sometimes finds itself a touch off the rails. The director of such bleak, uncompromising, grit-in-their teeth films as The Proposition, The Road and Lawless has taken a sharp left turn outside of open road, societally barren doom and gloom into rough and tumble, inner city gangland doom and gloom. Influence-wise, Hillcoat wears his heart on his sleeve, making pointed references to the half a dozen crime dramas that inspired Triple 9. Visually, the film reeks of Michael Mann. The Atlanta streets and clubs take on a insta-filtered quality of danger and mystique, half-baked but alive in all-enveloping primary colors. The Chicago-born Mann birthed an affixation with LA that the Queensland Hillcoat has lent to Atlanta. The cartel-run streets ooze a gross sense of tattooed menace, often urging viewers to surrender to fetal positions, and Hillcoat does a supreme job of establishing place and mood in these moments. Nicolas Karakatsanis’ shadows creep and crawl over a stable of shadowy character, not necessary affixing shades of ambiguity to the unquestionably conflicted characters so much as texturing the dreary landscape in which they find themselves. That most of the big action moments play out in direct sunshine inverts the otherwise unrelenting blackness that lies beneath – in the shadows where most of our characters find themselves outside of these tent-pole moments – rotting away at the corrupted units with their hands festering in proverbial cookie jars. One of these individuals is Marcus (Anthony Mackie), a gang unit cop who has, for reasons never fully explained, linked up with a crew of low-profile, highly effective heist thieves. He finds himself in the same company as ex-special-ops now-criminal Michael Atwood (a never-more-misanthropically-charismatic Chiwetel Ejiofor), Atwood’s comrade in arms Russel Welch (Norman Reedus) and his ex-cop little-brother Gabe (Aaron Paul) and the unscrupulous homicide detective Rodriguez (Clifton Collins Jr.). They work for a Russian Jewish crime syndicate head up by Irina Vlaslov (Kate Winslet) who, again for reasons not really explained, puts a hit on the crew unless they are able to retrieve a classified document locked down in a highly secure zone. After weighing possibilities, they decide their only option is to incite an officer down (code 999) to distract the police from the real mission at hand and elect rookie cop Chris Allen (Casey Affleck) as their unlucky patsy. Odds are padded by the fact that Allen is the nephew of the stoned-off-whatever-he-can-get-his-hands-on force sergeant Jeffrey Allen (a pitch-perfect Woody Harrelson). A vast spiderweb connects the many figures rubbing up against one another with often only a spiderweb’s breadth of substance lent to explain their affiliations. Regardless, the rippling butterfly effect of one’s decisions often dictate the future stakes of the others and the dominoes fall (sometimes skillfully, sometimes clumsily) until most are toppled. Ample thought is spent stringing together the historicities of how ex-military groups could feasibly affiliate with Hasidic mafiosos and rally some morally bent cops to their cause but the equally important wheels of why is more often than not lost in the cogs. 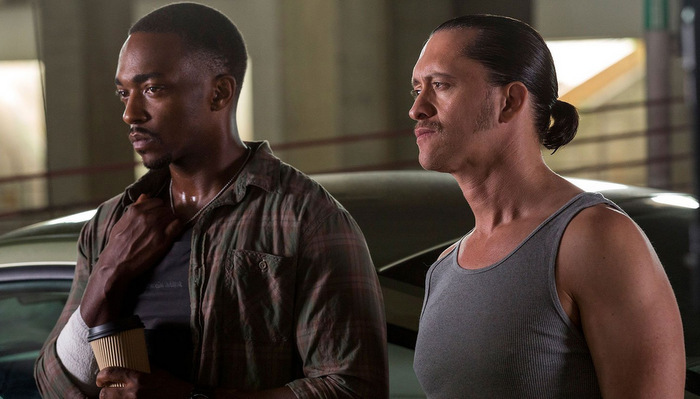 Nonetheless, Triple 9 manages to dress up its inadequacies in colorful, fluid performances from its mostly outstanding cast and cap it off with some expertly crafted action beats. Harrelson steals the show as the short-toothed Jeffrey Allen, jutting his over-active jaw into any given situation, from the crime scene to a grifter watering hole, almost always inebriated or doped out on some illicit substance and all the more unpredictable for it. Ejiofor is also a standout, brining the kind of cool, calculated machismo that defined Denzel Washington’s early career with something serpentine and vaguely malevolent. Both he and Mackie are given the most to play with as vessels of corruption, exploring the untidy corridors of “how far is too far?” and both end up given similarly sloppy endings. Though underwritten and somewhat blasé on the page, the typically excellent Casey Affleck makes the otherwise thinly-crafted Chris Allen worth giving a damn (an accomplishment is notable in and of itself) whereas Winslet’s Jewish mob wife is passable if never actively imposing. On a side note, who was it exactly that issued Kate Winslet carte blanche with foreign accents? Ever since she won an Academy Award employing her best German timbre, the woman has issued herself as many vocal passports as she has red carpet outfits. Consider the clock on that gambit expired. Convenience rears its ugly head as post-script events must hurriedly align, with many characters shooed onto their marks with little narrative nuance. With so many loose ends a’blowin in the wind, one worries that Triple 9 may cripple itself with an unsatisfying capstone, which both isn’t quite the case nor is it distinctively not the case. A certifiable stockade of whizbang skirmishes (a projects raid sequence led by Affleck and Mackie is truly superb) and double crosses tightens the noose, snaps some necks and walks into the sunset but not without leaving the faint apparition that the film as a whole could have been far greater. 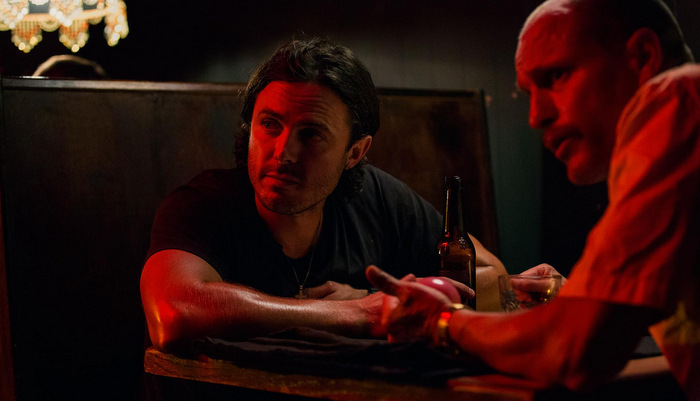 CONCLUSION: ‘Triple 9’ honors the esteemed tradition of American crime films, tipping its hat hither and thither to the greats that preceded it, creating a circus of variably intriguing characters to smash into one another along the way. Though the narrative tends to derail at critical moments, smartly crafted, monstrously tense action beats and many thoroughly enticing performances are cosmetic reason enough to warrant a sit through. This entry was posted in Out in Theaters and tagged Aaron Paul, Anthony Mackie, Casey Affleck, Chiwetel Ejiofor, John Hillcoat, Kate Winslet, Nicolas Karakatsanis, Norman Reedus, Out in Theaters, Reviews, Triple 9, Woody Harrelson. Bookmark the permalink.